The 3M� DBI-SALA� Hard Hat Coil Tether allows for fast and easy tethering of hard hats. The compact coil tether stays out of the way of the user, while an industrial steel clip with simple snap provides easy one-handed tethering. Heavy-duty steel industrial clip with simple flip-up snap allows for easy one-handed operation. 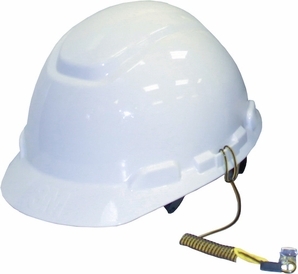 5 1/2" tail with loop makes the Hard Hat Tether easy to attach to any hard hat.